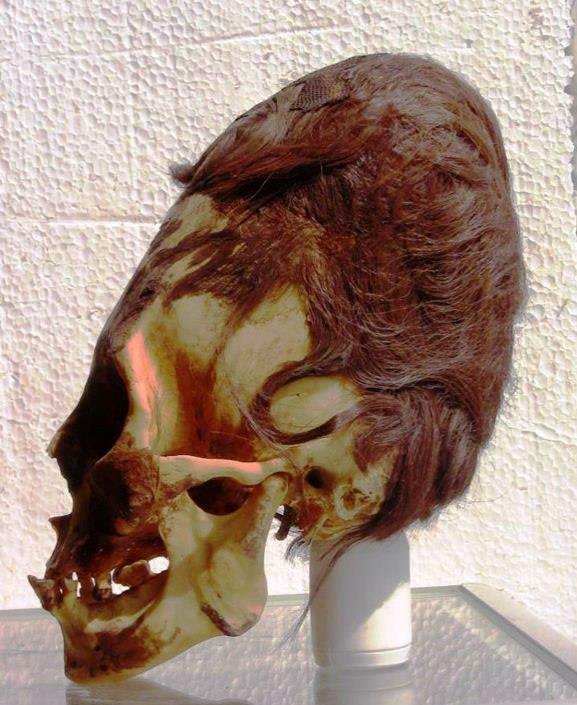 Thinking about giants, I thought back to the Paracas skulls, which I had made reference to in my book Fractals of God. I felt compelled to see what else I could find on this intriguing subject. Inherently, I knew there had to be more there to discover. To start, traditional science doesn’t seem overeager to question why some of the ancient skulls found in 1928 by Peruvian archaeologist, Julio Tello—now known as the Paracas skulls—are so unusually large and elongated. Ancient drawings and even Egyptian texts show that these beings were very tall, giants by today’s standards at 9 – 15 feet tall and some were even larger. 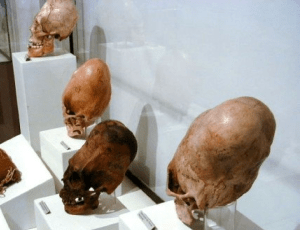 Many of these elongated skulls are displayed in South American countries, like the National Museum of Archeology, Anthropology, and History in Lima, Peru. But, interestingly enough, they have never been afforded the same cultural or historical perspective in the United States. Why? Their very existence conflicts with mainstream’s chronology of human evolution and brings up many questions regarding our true origins and whether Earth was initially populated by beings from other worlds. When large skeletons and skulls of giants with red hair started showing up in ancient burial mounds in the United States in the mid 1800’s to early 1900’s, pre-dating American Indians by thousands of years, an interesting thing happened. The Smithsonian Institution (est. 1846) rushed in and took possession of many of the human remains, but failed to ever put them on display despite public pressure to do so. In 1990, the United States Congress enacted a law called the Native American Graves Protection and Repatriation Act making it a criminal offense, with hefty penalties, to ever display such “cultural items” anywhere on U.S. soil. This edict especially applied to institutions receiving federal funding. This was signed into law by former President George H.W. Bush. While this law was understandably enacted to protect sacred Indian burial grounds from desecration, it made no distinction for significant anthropological finds like giant skeletons. Consequently, we lost access to the full picture of our true ancestry. A friend recently commented that: “History is like the universe—it’s ever-expanding.” True. It’s hard to bury the truth forever. Although the U.S. Government pressured newspapers not to publish pictures of these human anomalies, many newspapers still reported on them. The book, The Ancient Giants that Ruled America by Richard Dewhurst chronicles hundreds of actual newspaper stories reporting the discovery of remains of humans up to 18 feet tall, from California to New England, dating back to at least 9000 B.C. Outside of the dinosaurs, Neanderthals, and Indians, we don’t know a hell of a lot about America before those times. This is definitely a history changer. I was surprised to learned that over 3,000 giant red-headed skeleton remains were discovered on Catalina Island, off the coast of California near Los Angeles in the early 1900’s by self-proclaimed archeologist, Ralph Glidden. Regardless of the human treasures he unearthed, Glidden was easily dismissed by academia. He didn’t possess bona-fide university nor archeology credentials and he was known to sell the human artifacts he found for profit—which was considered unconscionable. Despite this scientific snub, more red-headed giant remains were discovered later on other California Channel Islands. While we continue to dig, figuratively as well as literally for answers, the question remains. Who were these giants and where did they originate and, even more important, why can’t our government embrace these fascinating findings with some open discussion? 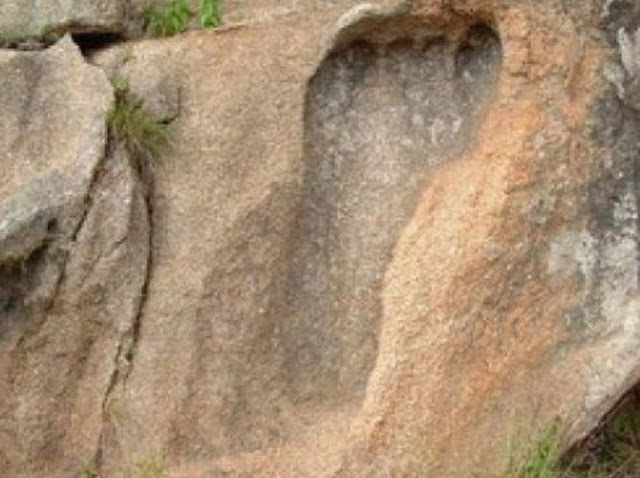 Giant human footprint found petrified in stone in South Africa by archeologists. Fantastic! Thank you for sharing the truth. It is most appreciated! I shared this on twitter. Also getting Trinfinity8 this weekend, finally. It’s my FAVORITE. I’m your biggest fan of Trinfinity8. Many blessings and much love! Namaste.